At the top: the person's name. Below: male ancestors of Alexander Smith bearing the same family name with their spouses. Pictures can be added to all generations. This example shows the maximum number of pictures that can be showed. Below: male ancestors of Alexander Smith bearing the same family name of her mother with their spouses. Below: ancestors of Alexander Smith. This example shows the maximum number of pictures that can be showed. At the top center: the couple, their children with their spouse (includes grandchildren if there is enough space). Left side: ancestors of Alexander Smith. Right side: ancestors of Bertha Simpson. At the bottom center: the couple, their children with their spouse and their grandchildren. Pictures available for main couple and their children. This example shows the maximum number of pictures that can be showed. We will answer it within 24 to 48 hours. *Instant delivery for PDF files. 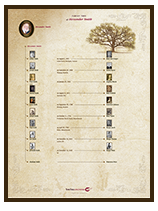 Size from 42" x 43" to 62" x 52"
Get beautiful and remarquable family tree posters showing your family's ancestry. See how easy it is to print your family tree with YourFolk.com/Posters. Get professionally designed charts printed on high quality paper or in PDF files. 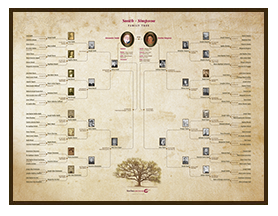 Impress your family and share beautiful posters of your family's ancestry to keep your history in memory. 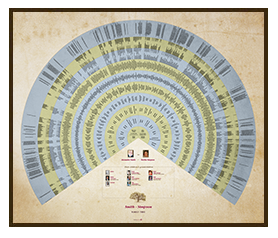 YourFolks.com/Posters is offering you an easy way to print your family tree and hold a great gift for your loved ones and yourself. YourFolks.com is a well-known genealogy website, providing more then 900 000 members with unique services, remarquable products and an exceptional customer service. 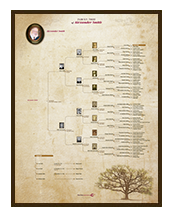 Print your family tree today with YourFolks.com/Posters!